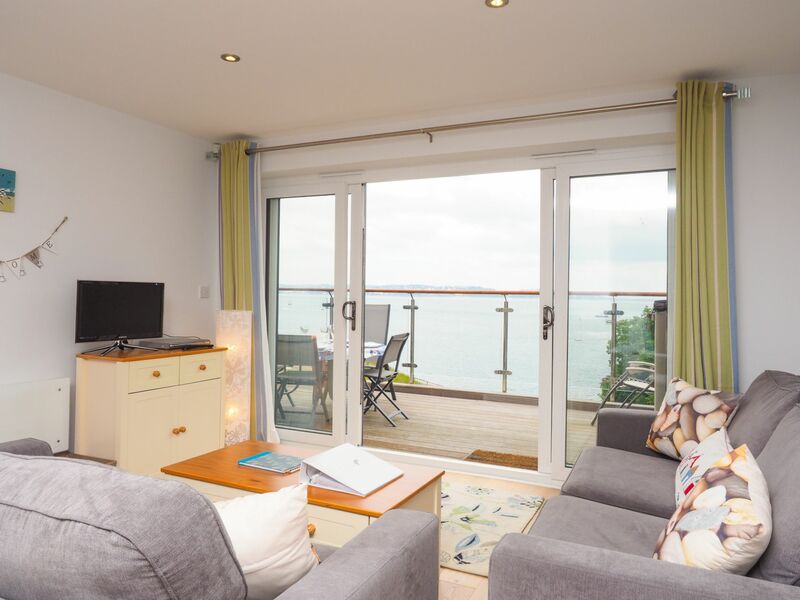 A modern, 2 bedroom luxury self-catering holiday apartment with a large balcony from which to enjoy the coastal and woodland views across Brixham and Torbay. 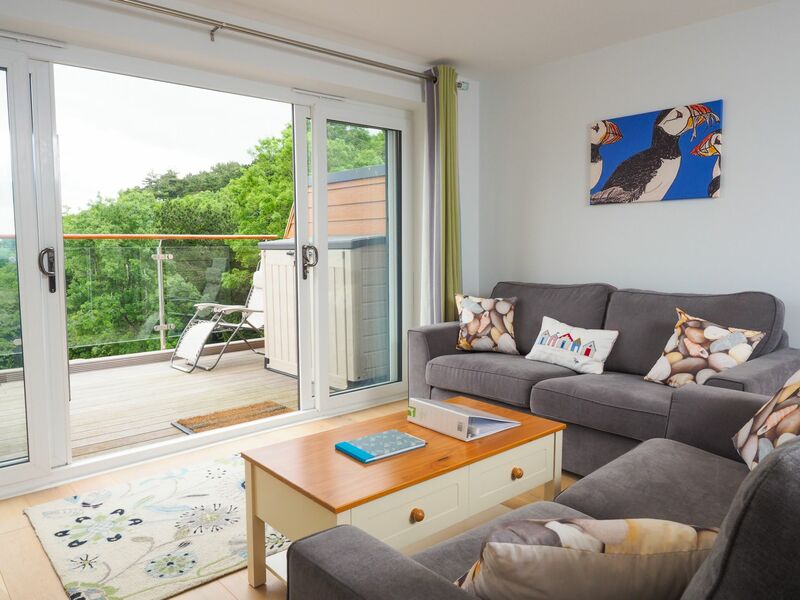 Set on the front row of this quite and peaceful new development in a National Trust woodland, it features private access to Fishcombe Cove below and a shared on-site open air swimming pool. 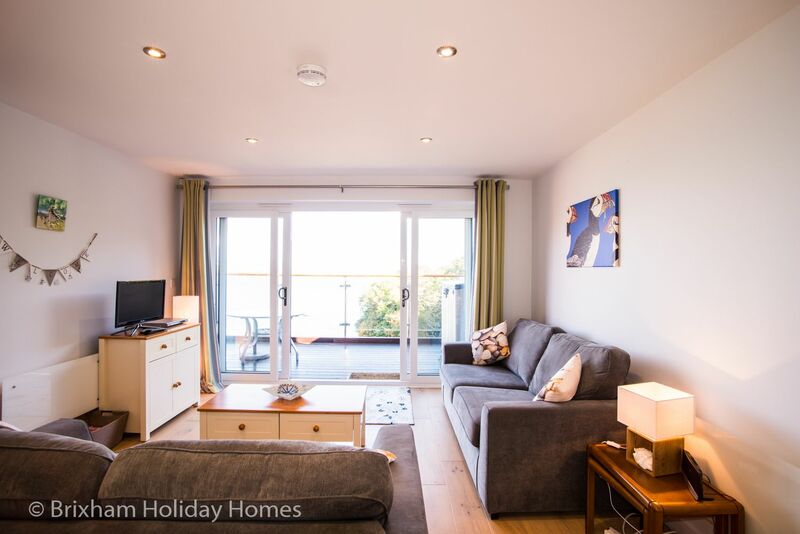 A modern, 2 bedroom luxury self-catering holiday apartment with a large balcony with sea views. 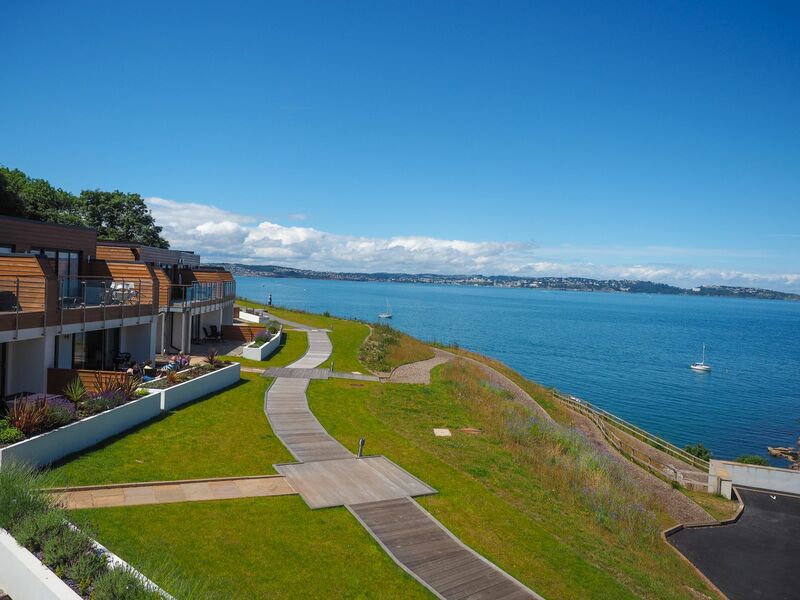 The Cove is a new development of 35 luxuriously furnished and decorated waterfront apartments in a quiet, elevated position above the beach at Fishcombe Cove. The South West Coastal Path runs behind the development and it's bordered by National Trust Woodland to the right. 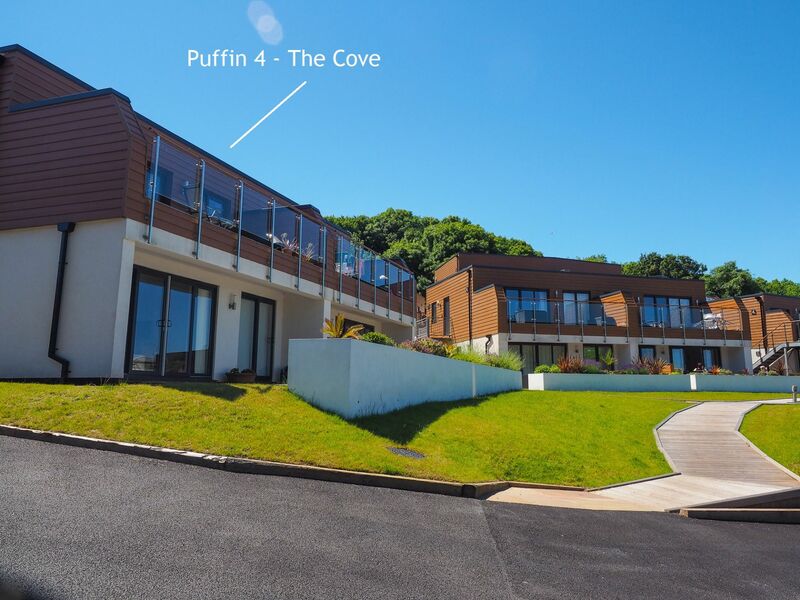 Puffin is the first block of 4 apartments, close to the entrance and car park of the development. 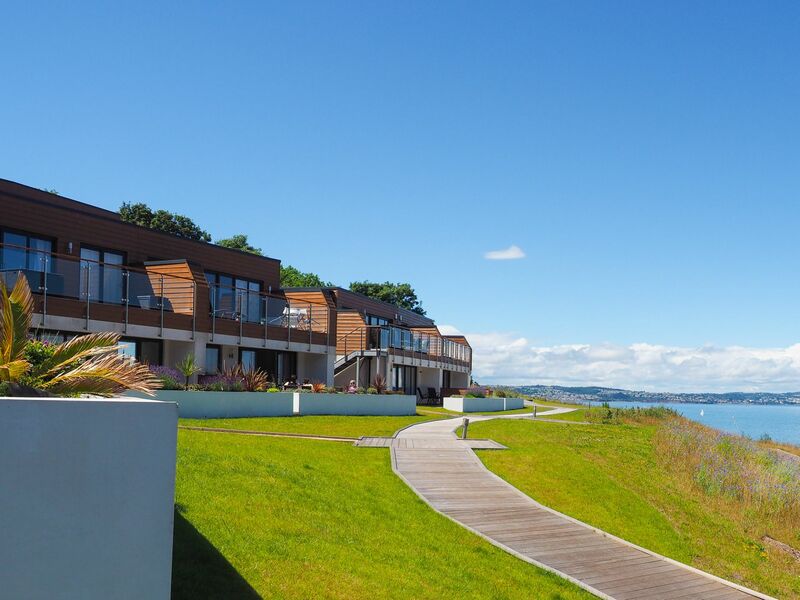 It's in a super prime front row location which enjoys beautiful unobstructed sea and woodland views. 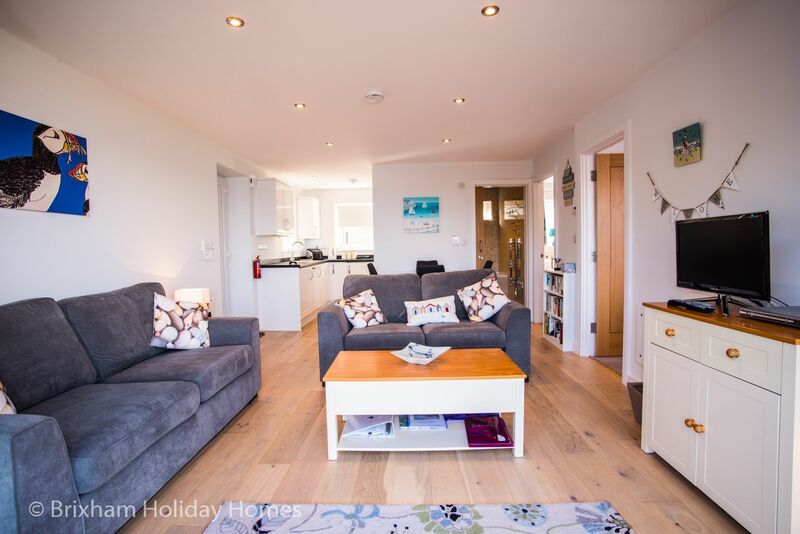 Puffin 4 is furnished in a bright contemporary style, the open plan kitchen, dining and living space are all set up to take full advantage of the superb location and private setting overlooking Torbay. 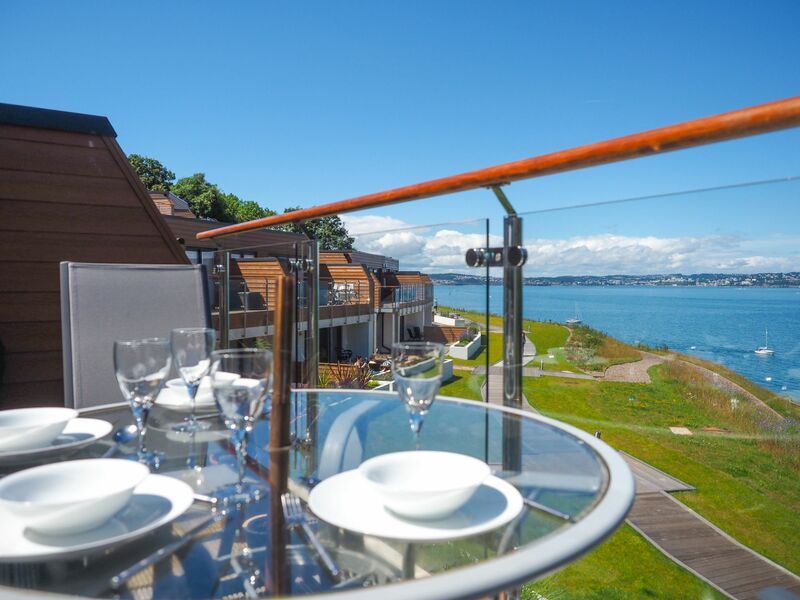 Enjoy wonderful sea and woodland views from your lounge with direct access to your large private decked balcony for alfresco dining or watching the sun rise over Battery Gardens and glistening Torbay. 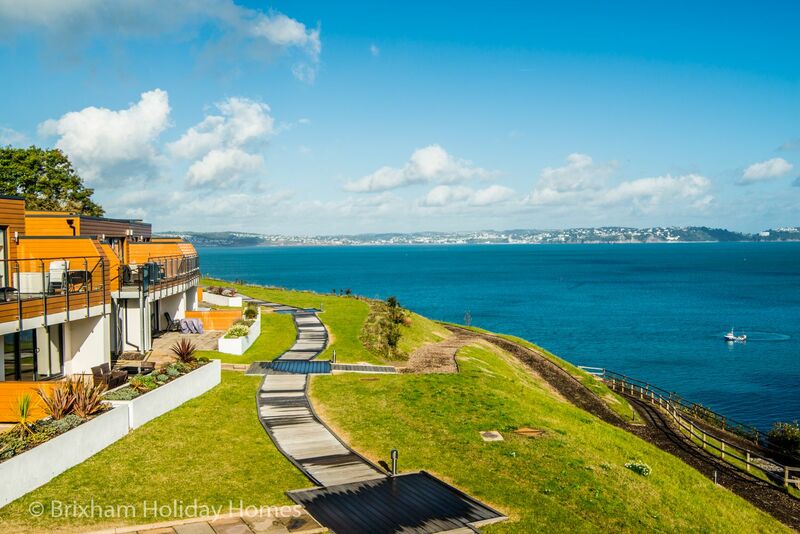 Cook up a storm on the supplied gas BBQ or simply relax on a sun lounger and take in the sparkling blues and peaceful nature of Torbay. 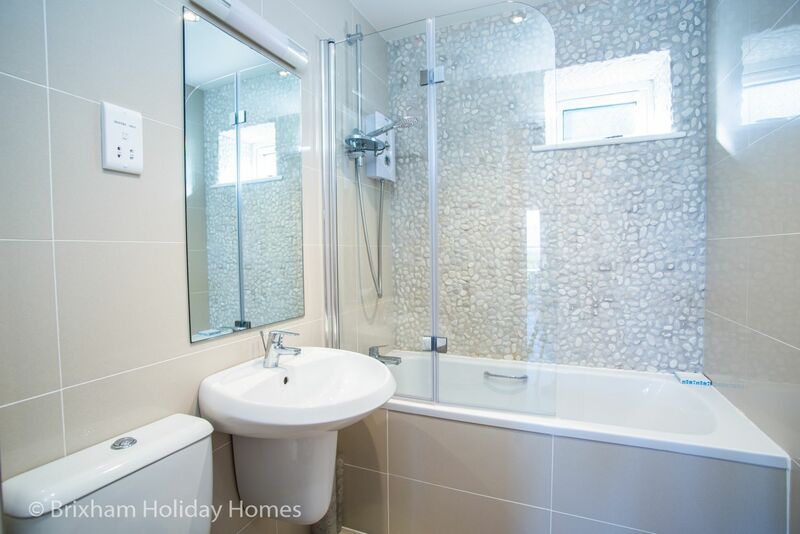 Your apartment is fully equipped with everything you need for a relaxing holiday. 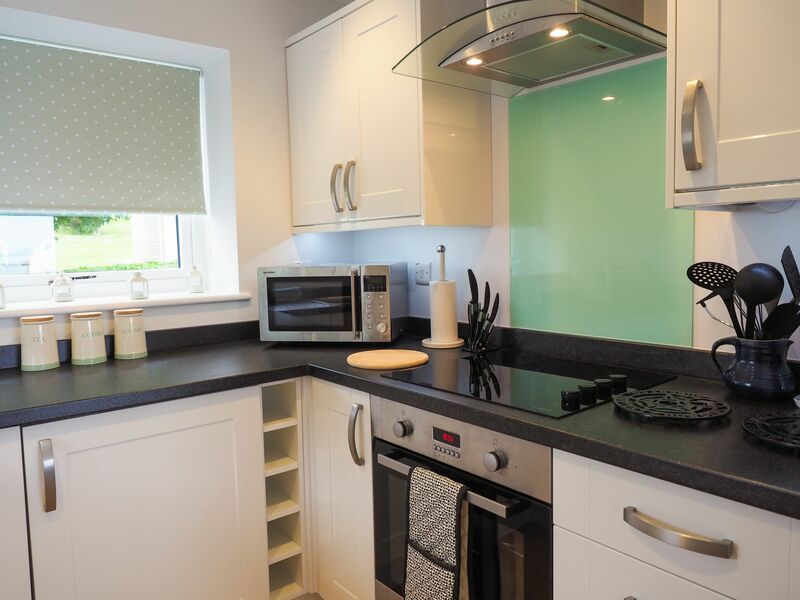 The modern kitchen includes a dishwasher and washing machine, fan oven, ceramic hob and microwave. 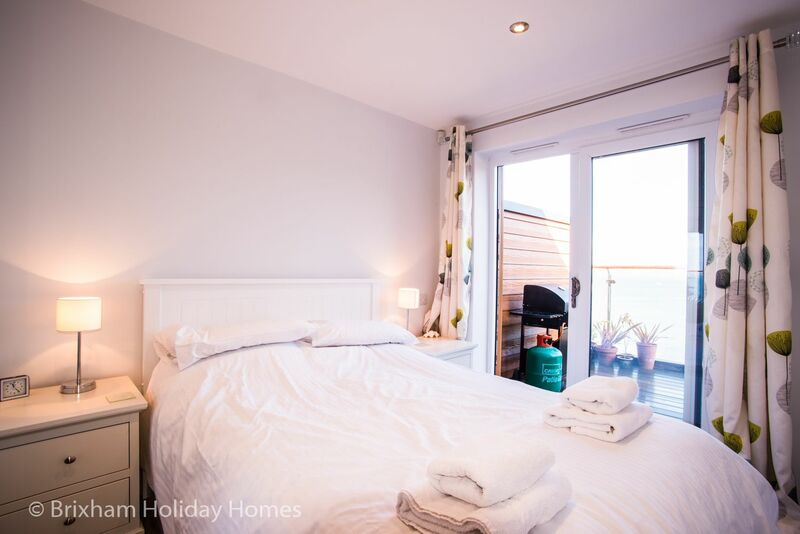 The master double bedroom has direct access to the large balcony and sea views. The second bedroom has 2 single beds. The family bathroom has a bath with shower over. 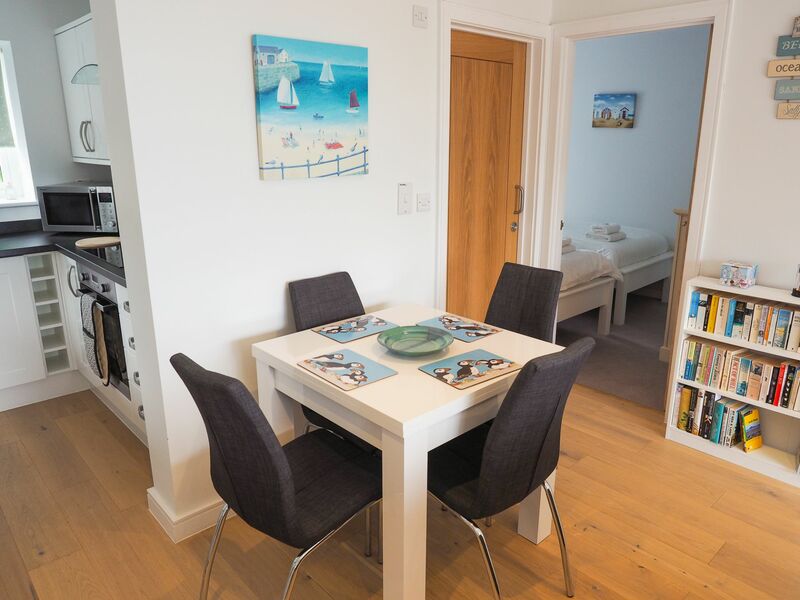 A dedicated onsite parking space, close to your apartment, is included as is wi-fi, access to the shared onsite swimming pool (summer only), quality bed linen & towels and all utilities. 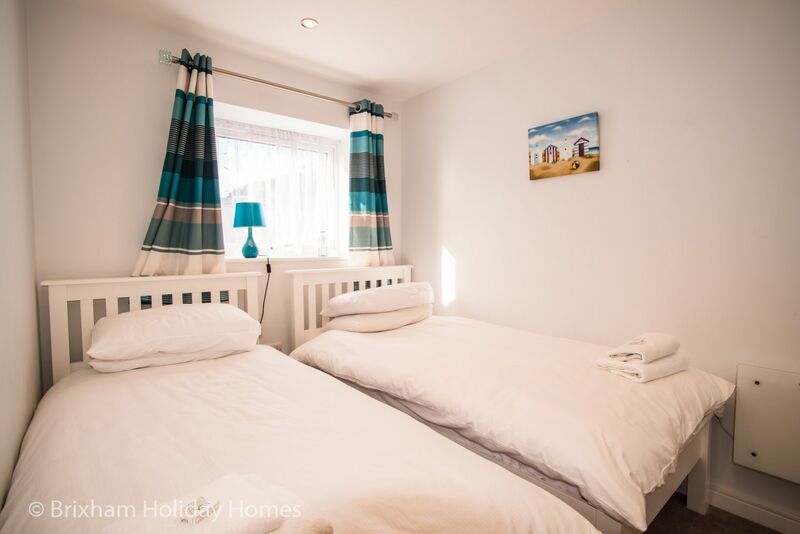 Short breaks of 2 nights or more are available at most times except summer school holidays. If short break prices are not displayed, please enquire and we will quote you. Damage Deposit - your card will be pre-authorised for a £100 security deposit when you pay your balance. This authorisation is released within 7 days of departure. This is our second stay in puffin 4 this year. ItÂs a beautiful apartment with everything you need for a comfortable stay. The views are amazing, and a superb location, I am sure we will be back again. 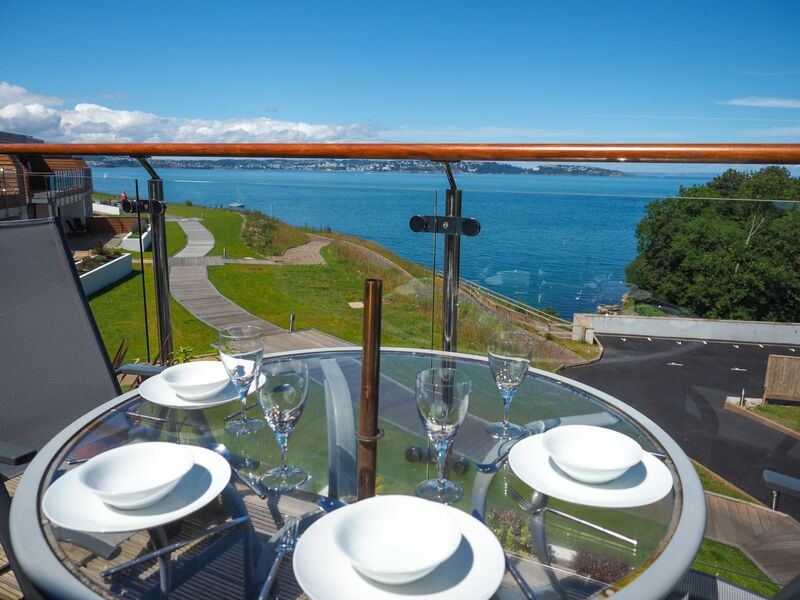 A luxury short break with amazing views. 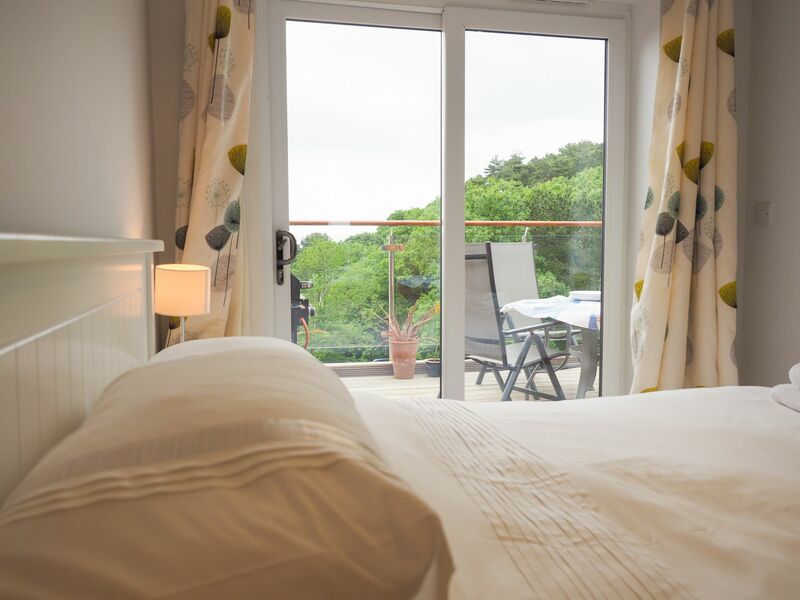 We stayed for a 3 night break, the main reason for booking this accommodation was that it seemed top end, with an excellent view, and away from the crowds as it was a treat for my wife's Birthday, and it met our expectations and more! 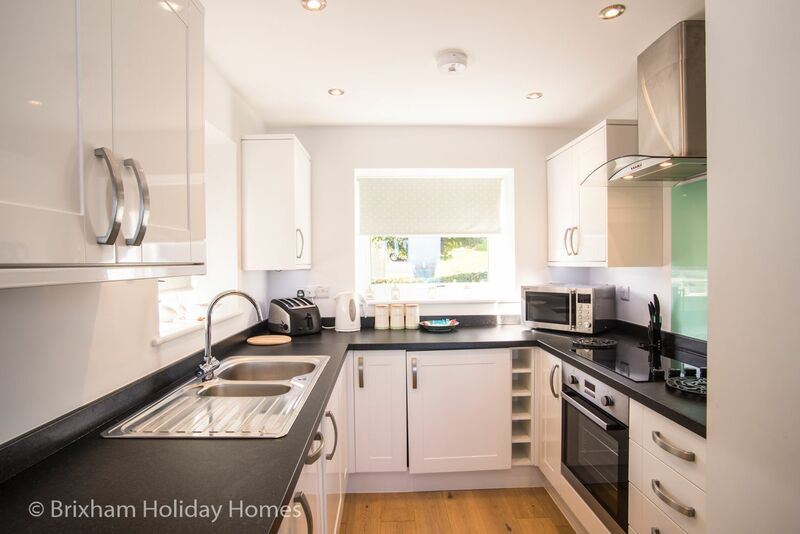 The apartment was really well equipped, and everything you might have needed for a self catering break was there, plus it was nice & clean, and felt cared for. The sofas were comfortable with amazing views of the bay and Torquay in the distance from whichever one you sat on. The bed was also comfy, and the duvet and cover were high quality, which aided a good night's sleep. There were sea views from the front bedroom, but those staying in the back wouldn't be as thrilled. The bathroom and shower were also very good, and the wifi was very reliable. We only sat on the balcony once as the temperature cooled down during our stay, but it was laid out well with good seating and plenty of space, plus the bbq looked decent quality, though we didn't get around to using it. I could imagine on a hot day it would be amazing to just sit for hours taking in the view, though one point to note if you are a sun worshipper, it sets behind the complex so you wouldn't get the heat of the sun in the late afternoon or evening from the balcony or even the beach. We knew Brixham town was fairly near but hadn't realised how close it was via the cliff top walk, and how easy it was to negociate it. Even at night with no street lights it was fairly easy to find our way back with torchlight and it felt very safe. In fact once we had parked the car on the Thursday outside the appartment we didn't need to use it again until we drove home on the Sunday. 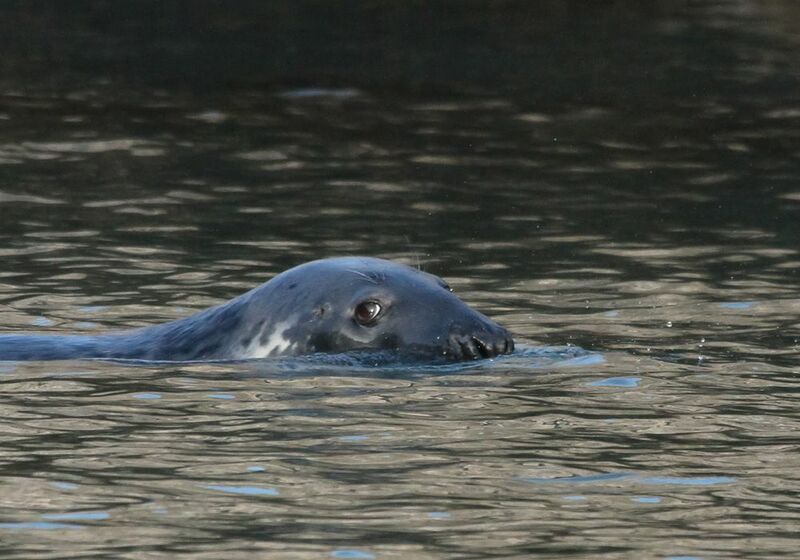 The beach below the complex was really good, with a small cafe if needed, and it was amazing seeing the local seals bob their heads out of the water close by as if to say hello to you. Some reviews have mentioned the noisy entertainment complex to the back of the apartment. Okay, there was a bit of live music on the Friday evening, and it could be heard from Puffin 4, but it died down around 10.30pm and we didn't hear a peep for the rest of our stay.We were actually amazed how quiet the whole of 'The Cove was during our stay, though realise that late September isn't exactly peak time. i should finally mention how accommodating the booking agent was in allowing us to stay until later on the check out day as nobody was staying for a few days after us - it really helped get the most of the weekend as we didn't have to rush that morning to pack and leave. 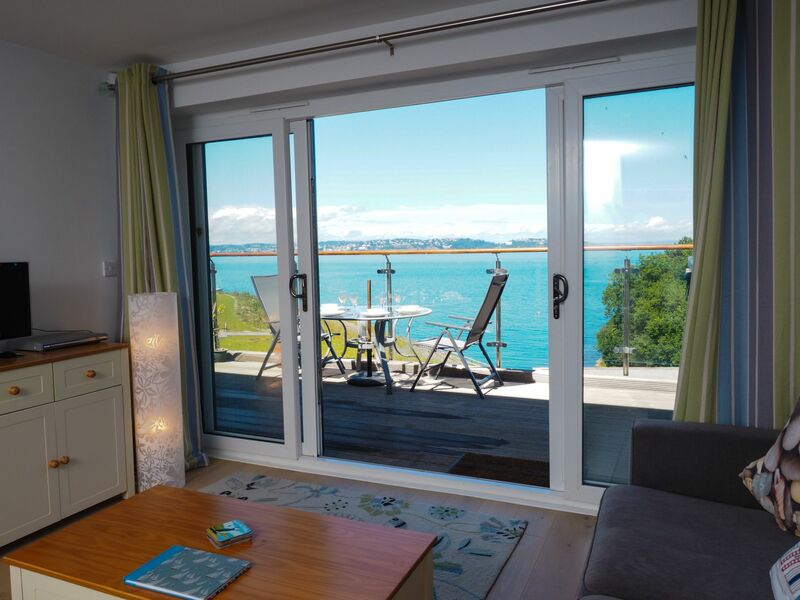 A truly wonderful apartment with uninterrupted sea views from master bedroom, living room (from both sofas too!) and balcony. 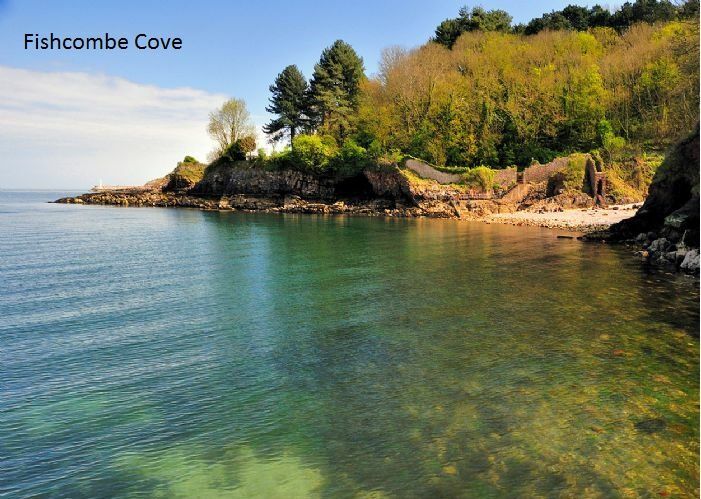 With 30 second walk to fishcombe cove and a 10 minute walk to brixham harbour. We, as a young couple, could not recommend staying here enough and, if youÂre reading this, really encourage you to do so. WeÂll certainly be back! The apartment had lovely views across the bay, always something to see. 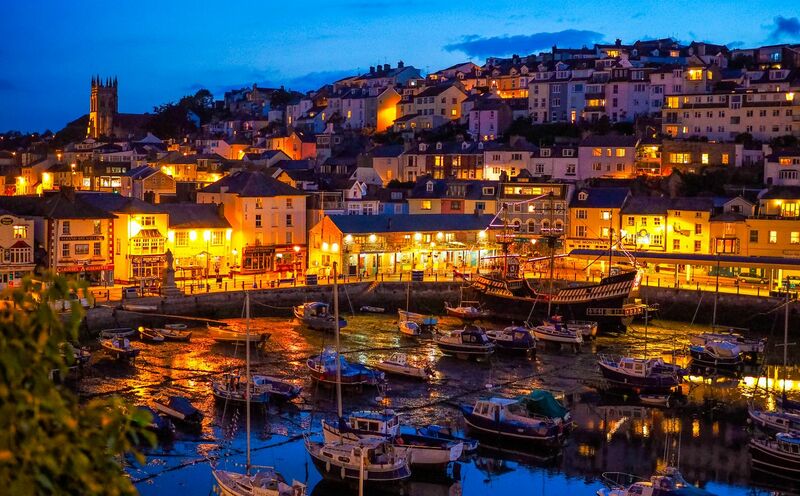 There was everything we needed in the apartment, it was just a short walk into Brixham where we found some good food and pubs, we particularly liked Liberty. The holiday park club adjacent served good food and had some entertainment at night. Just down the path was an open air heated pool small but very clean. 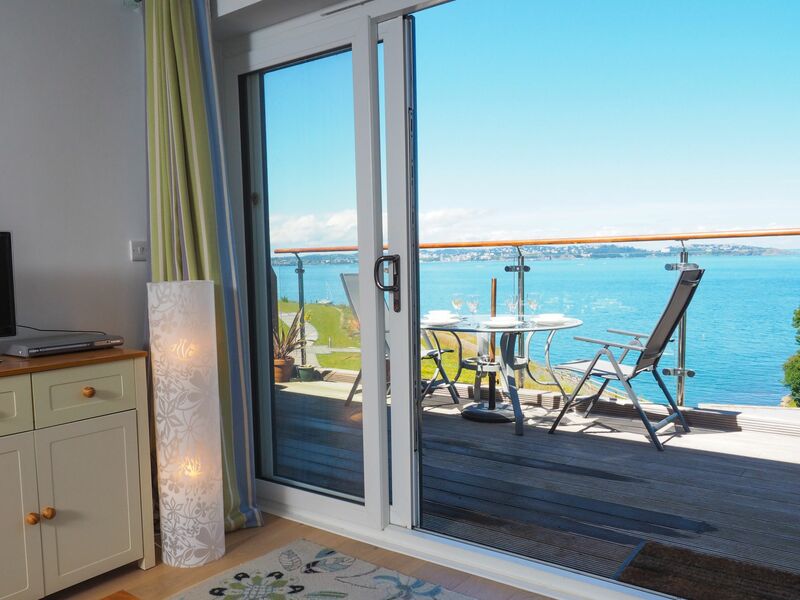 Puffin 4 was a great apartment, located about 15 minutes easy walk from the main hustle and bustle of Brixham. 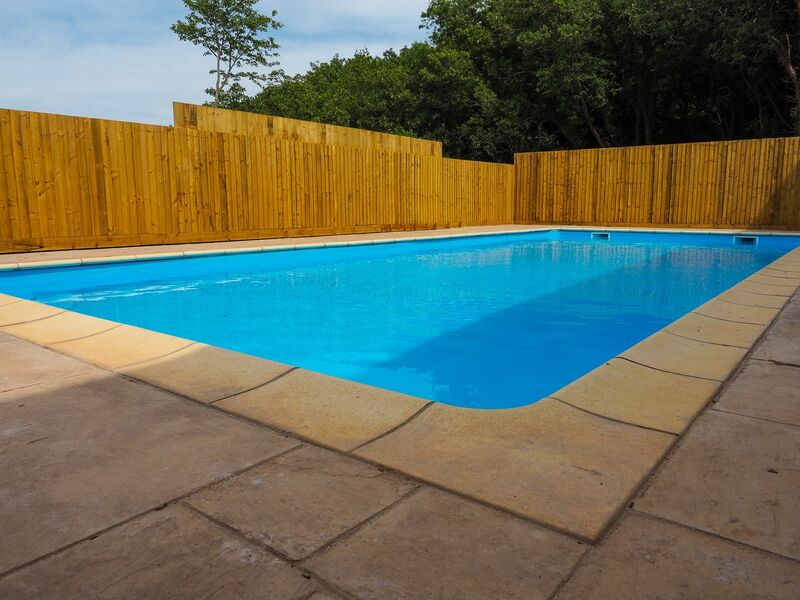 The accommodation was modern and well equipped and the private pool at the Cove was used daily by my children. 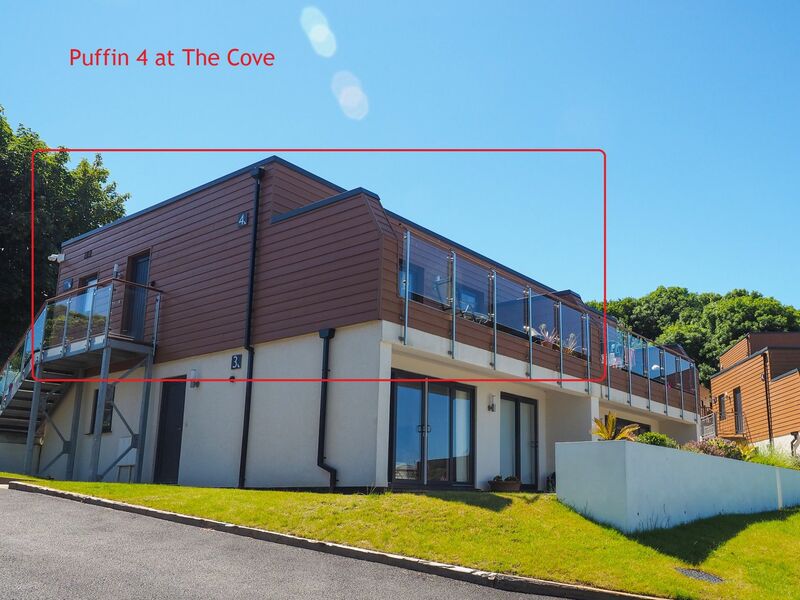 Puffin 4 - The Cove, is a first floor, front row apartment on The Cove development. 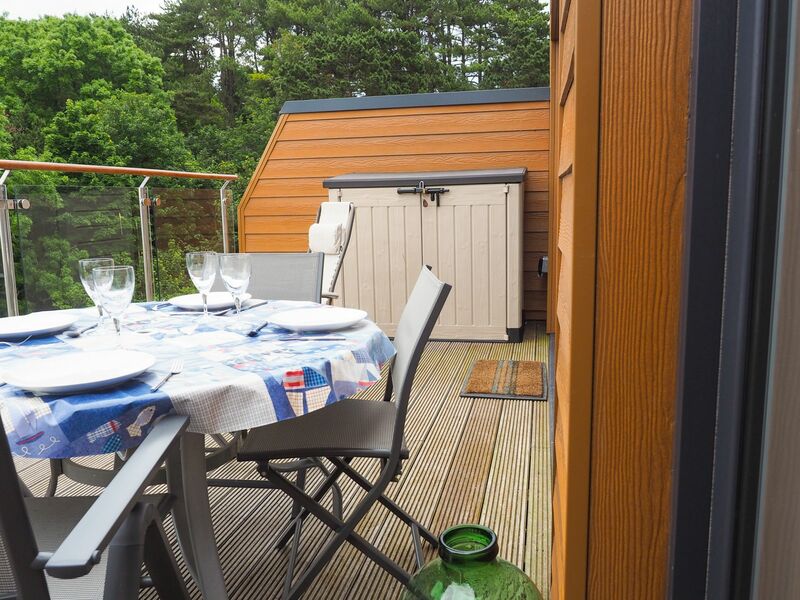 Set in a peaceful location next to the National Trust woodland, it's a 10–15 minute walk through the woods to the picturesque Brixham Harbour with its many shops, cafes, restaurants & attractions. An hourly bus to Brixham Harbour stops right outside the entrance.